If you have a custom domain powering your WordPress.com blog (say justanothersitename.com, for example) and you’d like to have an email address that is customized for that domain (like contact@example.com) you can create this type of email address using Microsoft Office 365. We’ll show you how. First, you’ll need to create an account by going to office.microsoft.com and sign up for the Small Business plan or higher to be able to use their business email service. 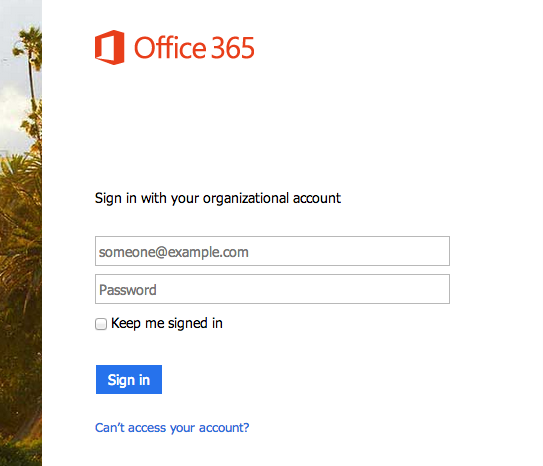 If you already have an Office 365 account, you can sign in to your account using your log in information by going to login.microsoftonline.com. Once you’ve logged in to your Microsoft account, you need to tell Office 365 which domain you want to use for your email. To do this, click the Domains option from the Admin menu inside your Office 365 account. From there, you’ll be able to enter your domain name into the text box provided and click the Next button to continue. Once you’ve done that you’ll be given asked to verify your domain using a TXT record. The first step is to confirm that you own the domain name you’re trying to use for your email. You’ll see that you are provided a TXT record type or the MX record type. We only need to use one of these to verify the domain name, so we’ll go ahead and use TXT. Copy the value from of the record (MS=XXXXX) so we have it in our clipboard. You will enter this value when you use the setup Office 365 button in the next step. If your domain is using WordPress.com’s name servers, you can automatically connect Office 365 without manually editing the DNS. You’ll need to enable the “_domainconnect” record as described in this support page, then follow the steps as listed on this Microsoft Office 365 support page. If you need help setting your domain to use WordPress.com’s name servers, please see this support page. Navigate to https://wordpress.com/domains/manage click your domain name then click the Name Servers and DNS section. The Name Servers and DNS settings have a quick set up option for several email services including Office 365. Click the Office 365 button to proceed. You will be prompted to enter the verification code. This is the text you copied to the clipboard in the previous step. Paste the text into the provided box and click Set Up Office 365. A green verification message will appear at the top of the screen to confirm the records were created. Continue back to theOffice 365 to complete the final steps. Back in the Office 365 Admin screen, we’ll see a button which says Verify. When we click this button Office 365 will check your domain to see if it’s been verified. It can take a little while before Office 365 is able to find the record to verify your domain so don’t worry if it doesn’t find it right away. Go and grab yourself a cup of tea and try again in 15-30 minutes. You can try again in 15-30 minutes when the record has had time to update. The third step of Office 365′ setup wizard is to set up your online services. The first option requires you to change the name server records at your domain registrar, which is WordPress.com. We don’t want to do this, because it means your custom domain name will no longer work with your blog. Instead, we need to choose the second option to manage your own DNS. Click Next after choosing this option to continue. Office 365 will check the updated records and let you know which records if any, haven’t been found yet. These records will take a few minutes to update and in some cases they can take up to 72 hours to completely update. Perhaps have another cup of tea while you wait? You can click Verify again to check whether the records have now been updated. When the records have successfully been updated, you’ll see a confirmation message on the screen which says that from now on any emails sent to addresses using your custom domain name will arrive in your Office 365 account. Just click Finish and then you’ll be all done completing the setup of your custom domain email. You can test that your new Office 365 email address is working by sending an email to your new address from another email address that you own. When you’ve done that, click Outlook in your Office 365 menu bar to access your new inbox. When you receive that email in Office 365, send a reply back just to make sure you can send from your new email address as well. And that’s it! You should now be able to send and receive emails through Office 365 by using your custom domain name here at WordPress.com.